FOA calls for a boycott of HP because of its complicity in the occupation by providing support at Israeli checkpoints and its military which helps the colonisation of Palestinian lands. I pledge to boycott HP products until they stop supporting Israel's illegal occupation of Palestine. Write to the CEO of HP Meg Whitman. Edit the suggested letter below before sending. I am writing to you to raise my deep concerns surrounding HP’s business with Israel’s military and civil administration and the direct role this plays in sustaining the illegal occupation of Palestine. 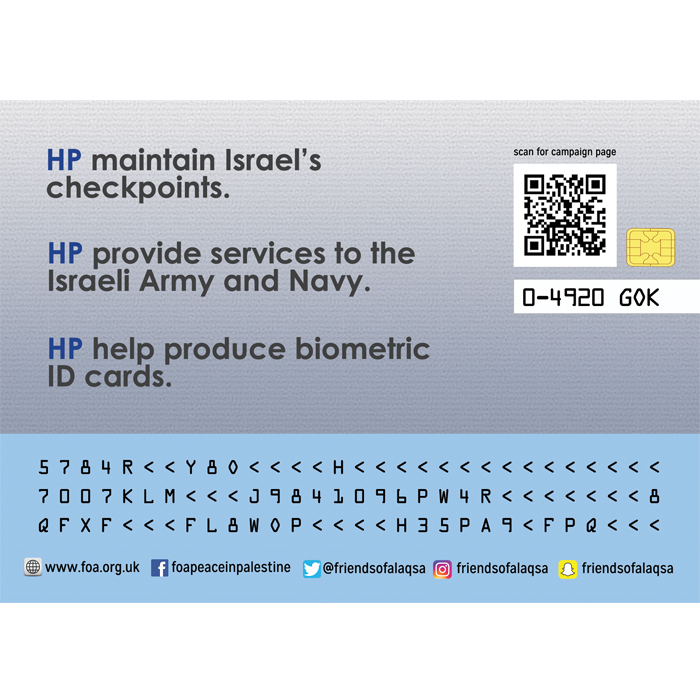 I am aware that HP provides the technology for the control systems used in Israel’s checkpoints, are the exclusive provider of computers to the Israeli military and provide the Israeli government with its biometric ID system. I also understand that HP have contracts with the Israeli prison system, despite serious concerns surrounding children’s rights - including the rights set out in the UN Convention on the Rights of the Child. Both the checkpoint system and the computers provided to the Israeli military by HP helps to maintain the Israeli occupation which is unlawful under international law. This is the world’s longest occupation in modern times and has had an enormous costs to human life which is ongoing. The checkpoint system involves significant restrictions on Palestinian movement within the West Bank and is an infringement on the rights afforded in the Universal Declaration of Human Rights - notably Article 13. 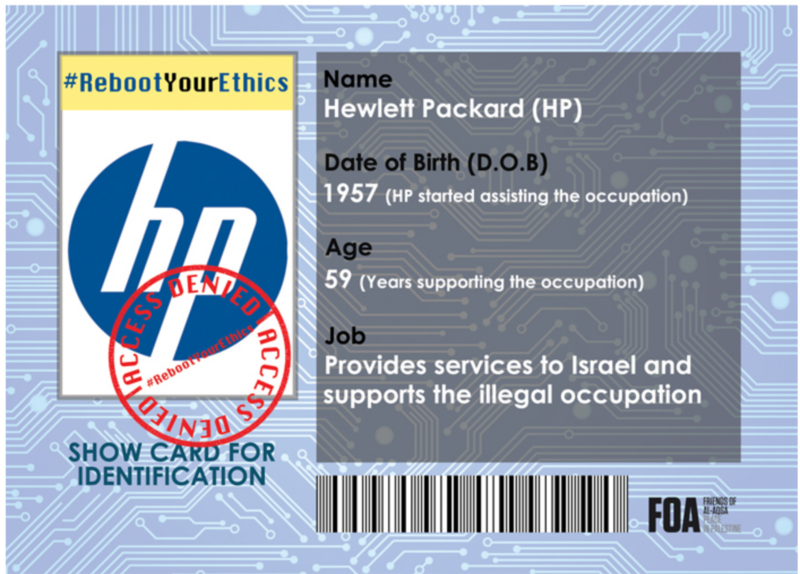 HP also play a critical role in providing the biometric ID system for the Israeli administration. These IDs determine the level of rights a holder is entitled to. Currently there are more than 65 Israeli laws that discriminate against Palestinians in Israel and the occupied settlements. Under this system Palestinians are afforded fewer rights than Israelis and face a fundamental inequality. HP’s relationship with Israel’s prison system also has significant ramifications due to the detention of children and political prisoners within this system, and the damage this poses to human rights. The UK government has highlighted that these detentions contravene six different articles of the UN Convention on the Rights of the Child including but not limited to articles 2, 3 and 40. These violations were described as ‘severe and continuous’ by the UN Committee on the Rights of the Child. HP’s involvement in Israel’s prisone system contributes to these international violations. I understand that you may wish to avoid adopting overtly political stances, however we believe that support for human rights and opposition to discrimination are legal and ethical positions, remote from partisan politics. 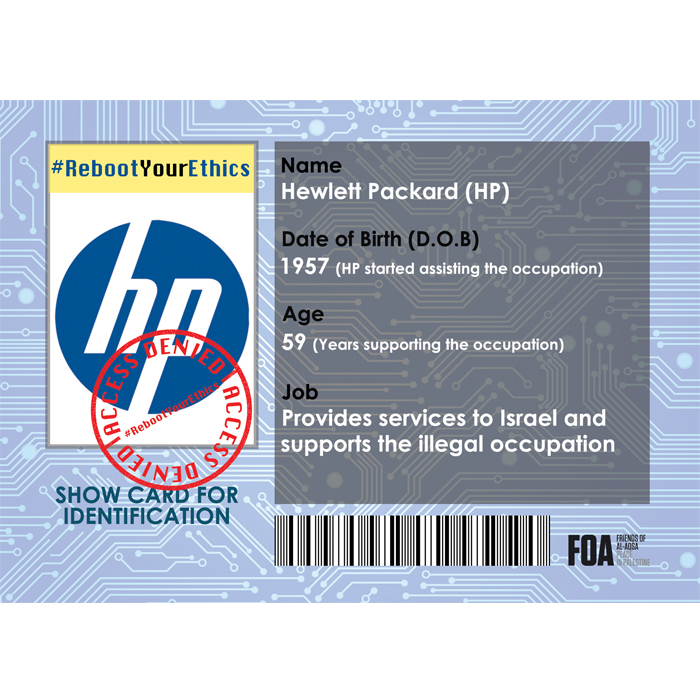 We understand that HP’s current business relationships with the Israeli military and civil administration violate your policies on corporate responsibility. Consequently, we would like further clarity and a commitment from HP to withdraw from activity which undermines human rights, including engaging in business with Israel’s military and civil administration. We are hopeful that HP will respond to these concerns and respect the fundamental rights of the Palestinian people. How is HP involved in the occupation? HP is the prime contractor that has installed and maintained the control systems at checkpoints which restrict movement for Palestinians, known as the Basel system. This set of restrictions on movement directly contravenes the right to free movement set out in the Universal Declaration of Human Rights. The checkpoints erected by Israel causes severe overcrowding and take hours to pass through as thousands of Palestinians attempt to travel through for work. By HP providing the technological material for the Israeli checkpoints, they sustain the humiliation, injustice and dangerous conditions Palestinians face daily. Do we need to throw away our HP laptop? No. We are asking you to sign the current pledge to not buy any more HP products until they end their direct support for the Israeli occupation. Yes, boycotting companies helps to put pressure on businesses that are involved in the illegal occupation. Every time somebody joins the boycott of HP, their oppressive role in the occupation is undermined. What does HP have to say? HP’s CEO Meg Whitman stated that the company will “look into” the issue. However, it is already in violation of their policy on corporate responsibility. Ramadan is a time when Muslims consume dates every day. Unknowingly many of us purchase Israeli Medjool dates. #CheckTheLabel encourages knowing where your dates are from. When shopping this Ramadan avoid dates labelled from Israel, West Bank and Jordan Valley as they’re grown in illegal settlements on land stolen from Palestinians. 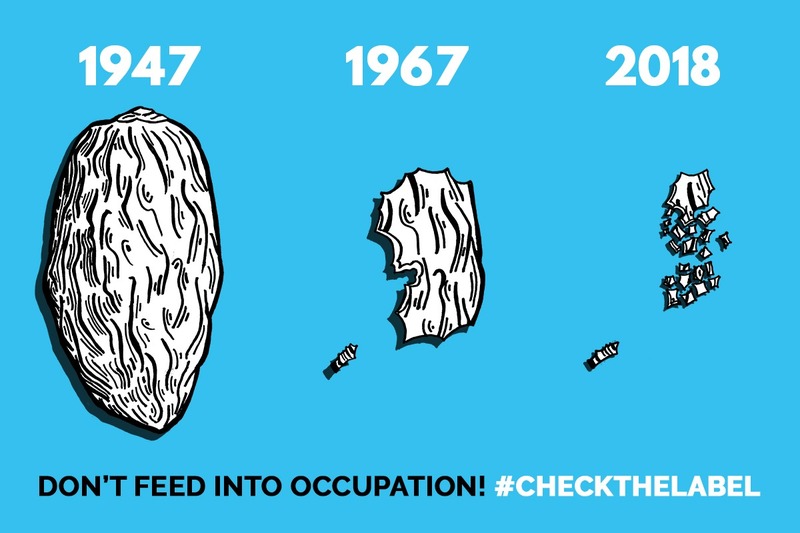 Don’t break your fast with dates that fund the illegal occupation of Palestine. 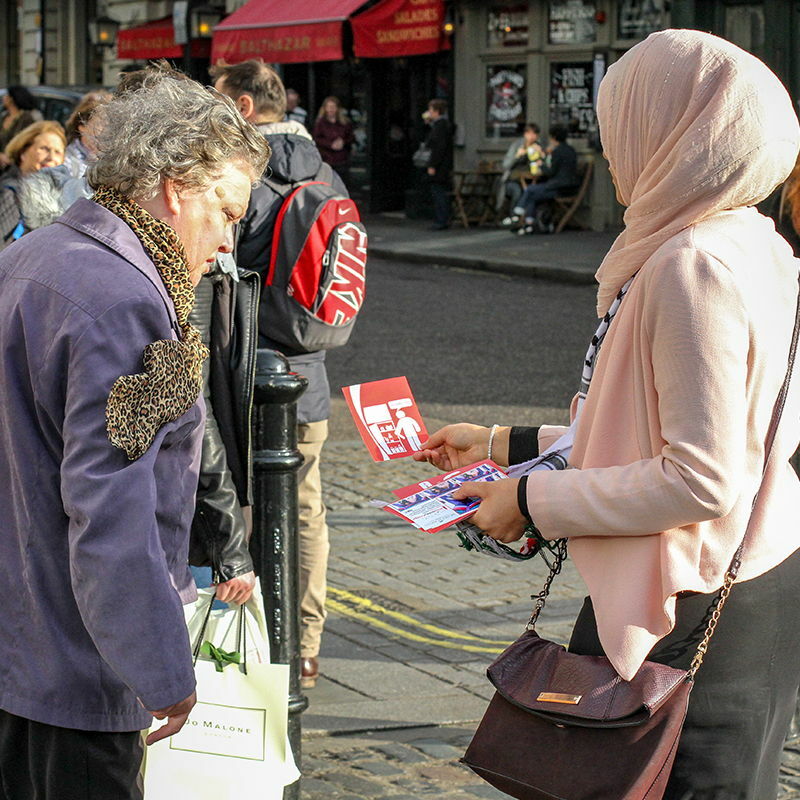 The #HandsoffAlAqsa campaign is about educating people about the significance of Masjid al-Aqsa as the third-holiest site in Islam, which is currently physically deteriorating under the Israeli occupation. 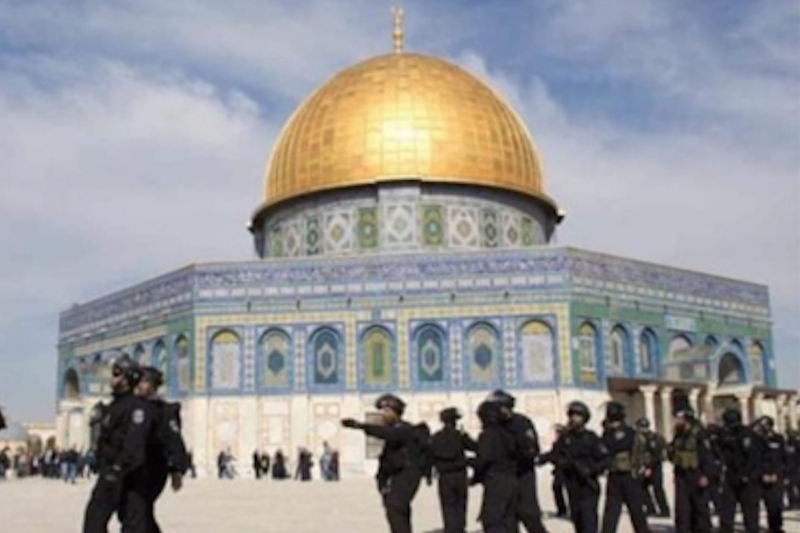 We want to put al-Aqsa on the global political agenda in order to protect Masjid al-Aqsa from occupation and preserve this fundamentally sacred space.